Sounds like a really fair review Kathy. It has got panned by some critics and the IMDB rating was 4.4 when I last looked. I was thinking of going to see it last night, but when I saw the initial reviews and ratings coming in I decided to hold off, so thanks for your considered review. If I am at a loose end next week I might go see it as it looks as though it won’t be too bad, even if there are a few flaws. If it helps sway your decision, Paul, we’re heading into a lean time as far as quality Bollywood releases are concerned. Katti Batti looks good, but that doesn’t come out until September 18. After that, the next most promising film is Talvar on October 2. If you’re on the fence about Phantom, I say go for it. Hi Kathy, I always look forward for your review first before going for the movie since your review is never biased and always balanced. I would definitely go to watch Phantom since my few very good friends are part of it including Mohammed. Zeeshan Ayyub. Thanks, Rajeev! Mohammed Zeeshan Ayyub and Rajesh Tailang add a lot of class to the movie as a pair of RAW agents. I’m always happy when they show up on screen. Glad to hear from you Kathy! I would definitely watch it soon and let you know. Thanks. Balanced article. Thanks for writing it. I was initially discouraged by the 4.5 imdb rating but when I read the reviews i realized people aren’t being fair. Few people gave 1 star to the movie just because they felt it was anti-pakistani movie. That’s when I knew rating is not fair and i went to see the movie. Its not a perfect movie but its not as bad as people have portrayed it. It is based on some facts but at the end of day its a fiction, action thriller movie. Thanks, PI. Director Kabir Khan is pretty careful to lay blame at the feet of terrorists and politicians, portraying ordinary citizens of Pakistan as folks just trying to make a living, who also suffer violence at the hands of extremists. I ended up going to see it this evening Kathy and thoroughly enjoyed it. I think I was expecting it to be very mediocre, as the reviews on IMDB had been so bad, but I enjoyed it from start to finish. It was like an extended version of the BBC series Spooks, which I used to enjoy, so it was right up my street. 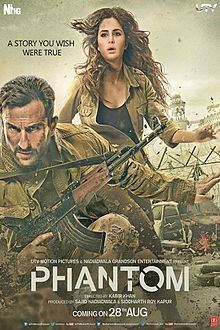 It seems all the 1-star reviews on IMDB are Pakistanis who are somehow thinking this is some kind of Indian propaganda movie, but to me it just came across as an anti-terrorist film, and definitely not anti Pakistan. I think maybe some of those giving it 1-star on IMDB haven’t actually seen the film. You mention that it is is far-fetched it parts, which it probably is, but it is no more far-fetched than ever Bond or Mission Impossible movie. I suppose I had the benefit Kathy of having seriously low expectations, so when it was way better than what I was expecting I probably liked it a lot more than I would have done had I just gone in with no preconceived ideas. Thanks for encouraging me to check it out. I’m glad you did. As for your 2.5 out of 4.0 I reckon that is about right, but if I was in a good mood – which I am – I might even nudge that 2.5 in the direction of a 3.0. Glad you had fun, Paul! 2.5 is my minimum threshold where I don’t feel like I wasted my time or money. It doesn’t have to be amazing, but it’s entertaining or novel. I’m glad you thought I hit the mark! Kathy, a question that befuddled me after watching it. Why kabir khan cast Katrina? She is a total misfit and has extremely limited (in fact no) acting ability. Saif’s acting was also patchy. Regardless of her acting abilities, Katrina certainly is popular. Whatever gets people into the theater, I guess.